The Cobblers are hoping to welcome back both Aaron Pierre and Jordan Turnbull into the team for Saturday’s Sky Bet League Two clash with Port Vale at the PTS Academy Stadium. Both players missed the 3-1 defeat at Cheltenham Town last weekend, with Turnbull injured and Pierre away on international duty with Grenada. 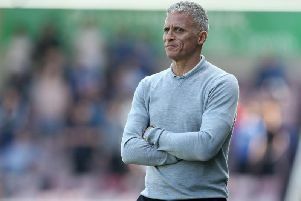 The pair were sorely missed as the Cobblers suffered their first defeat in nine games, but boss Keith Curle is hopeful both will be fit and ready to go against the Valiants. Pierre was due back in the country on Tuesday afternoon following Grenada’s 2-0 win in Puerto Rico, while it is hoped Turnbull will be back in training on Thursday. “With Jordan, he blocked a shot and slightly turned his ankle in training last Thursday,” said Curle. Pierre’s absence at the weekend came as something of a surprise to media and supporters alike, but Curle was well prepared for it. He had known about the call-up for more than three weeks, and it was a similar story for Timi Elsnik who made his debut for Slovenia Under-21s last Thursday. Pierre won his sixth cap for his country, but it was the first time he had played an international for two years, and when asked if it was a surprise call, Curle said: “I knew about the call-up about three-and-a-half weeks prior. “One thing I will says is I will never say to a player you are not to go and represent your country. And he added: “I did have a mini panic attack on Sunday, because I looked at the team sheet for the Grenada game and his name wasn’t on it! “But then I realised it was a clerical error and they had only put 10 names down. “We are hoping him and Timi Elsnik both travel back safely, with Tim making his under-21 debut as well (for Slovenia), so we are hope they don’t have any issues. As well as the expected return to fitness of Turnbull, Curle also had good news on the club’s other injured players. “Everybody is responding well,” said the Town boss. “Shaun McWilliams is back doing field-based training, Junior Morias is field-based training, and George Cox is also back field-based training, albeit still at Brighton. Another player to go away and get some international experience last week was Morgan Roberts, who spent four days on a Wales Under-21s training camp. The teenager frustratingly picked up a knock to his knee while he was with Rob Page’s men, but Curle says Roberts did well on his time away.